All new Toyota Tundra models include the features shown below. Additional equipment and option upgrades are available. 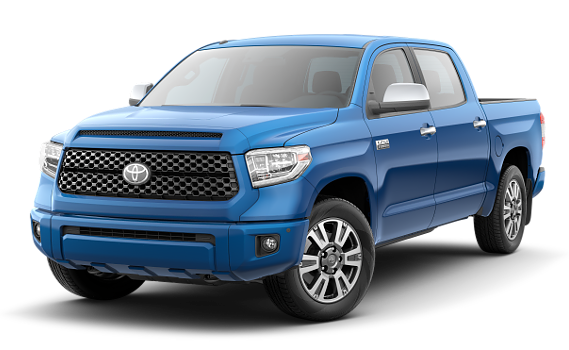 If you need specific answers about Toyota Tundra Trim Packages, Upgrade Options or Available Inventory, please Contact Us today. We appreciate your interest in our inventory, and apologize we do not have model details displaying on the website at this time. Please fill the form out below and our team will quickly respond, or, please call us at (651) 453-5230 for more information. 1 Based on manufacturers’ data.2 Before towing, confirm your vehicle and trailer are compatible, hooked up and loaded properly and that you have any necessary additional equipment. Do not exceed any Weight Ratings and follow all instructions in your Owner’s Manual. The maximum you can tow depends on base curb weight plus the total weight of any cargo, occupants, and added vehicle equipment. “Added vehicle equipment” includes additional standard/optional equipment and accessories added by the manufacturer, dealers, and/or vehicle owners. The only way to be certain of your vehicle’s exact curb weight is to weigh your vehicle without passengers or cargo. 3 The 2018 Tundra CrewMax 5.7L V8 is towing far beyond its published towing capacity in a one-time, short-distance event. Never tow beyond a vehicle’s published towing capacities. Always consult the Owner’s Manual. 1 Before towing, confirm your vehicle and trailer are compatible, hooked up and loaded properly and that you have any necessary additional equipment. Do not exceed any Weight Ratings and follow all instructions in your Owner’s Manual. The maximum you can tow depends on base curb weight plus the total weight of any cargo, occupants, and added vehicle equipment. “Added vehicle equipment” includes additional standard/optional equipment and accessories added by the manufacturer, dealers, and/or vehicle owners. The only way to be certain of your vehicle’s exact curb weight is to weigh your vehicle without passengers or cargo.2 The Integrated Trailer Brake Controller is an electronic system that operates in tandem with a properly equipped trailer with an electric braking system. It is designed to help the driver maintain trailer control by increasing or reducing trailer braking based on trailer weight. It is not a substitute for safe towing practices. Factors including speed, road conditions and driver input can all affect trailer braking control. See Owner’s Manual for additional limitations and details. 1 Do not rely exclusively on the Blind Spot Monitor. Always look over your shoulder and use your turn signal. There are limitations to the function, detection and range of the monitor. See Owner’s Manual for additional limitations and details.2 Do not rely exclusively on the Rear Cross-Traffic Alert system. Always look over your shoulder and use your mirrors to confirm rear clearance. There are limitations to the function, detection and range of the system. See Owner’s Manual for additional limitations and details. 9 Does not include parts and fluids, except emergency fuel delivery. Valid only in the continental U.S. and Alaska.